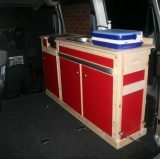 Now the cupboards are built I’m left with their installation in the van. This proved to be more of a headache than I had expected. 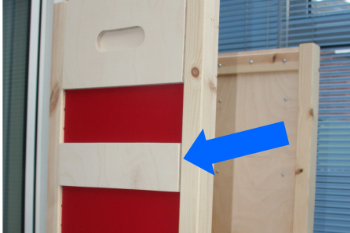 I measured every single one of the holes I needed to drill up to a fraction of a millimeter and when I put it all together… it didn’t quite fit of course. The cupboards are about 34cm deep, not including the worktop which extends to the back. This is because I had to install them in front of the wheel arches so they can be taken out easily while they look like a unit, separate to the van. At first sight, this wastes quite a bit of space, but I have a cunning plan for that space. I’m going to make blinds out of insulation material, the stuff you can buy on roll with a reflective layer both sides and and black veltrip to finish off. My van has darkened windows so I hope that will complement well without reflective material clearly visible from the outside, like you get with most ready made blinds you can buy. I am going to insert strong magnets which will allow them to be easily removed or put up. These blinds will live in between the gap behind the cupboard and the van’s side wall. I must admit that I blatantly ‘borrowed’ inspiration for this idea from Ryan and Mel from the Doyourdream website. That’s a project for later however… I’m thinking that I can also use that space to keep my paddles out of the way when I go kayaking again next year. The brackets were what I struggled with most. 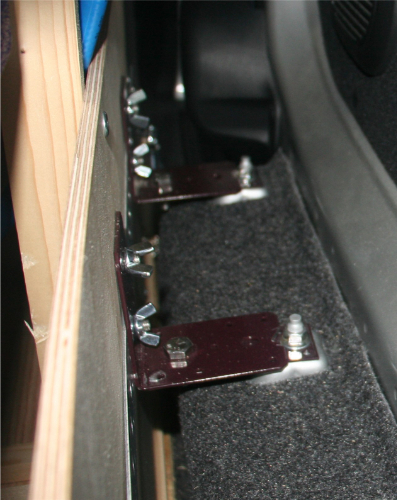 I was going to use the two bolts above the wheel arch that were holding the rear seat. 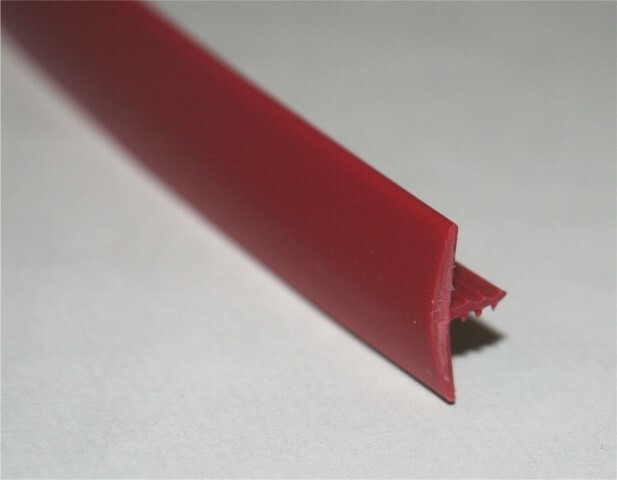 These are firmly connect to the van body and are ideal for helping attach the cupboard. I couldn’t find any brackets of the right size so I bought some flat metal plates and then two slightly shorter brackets. 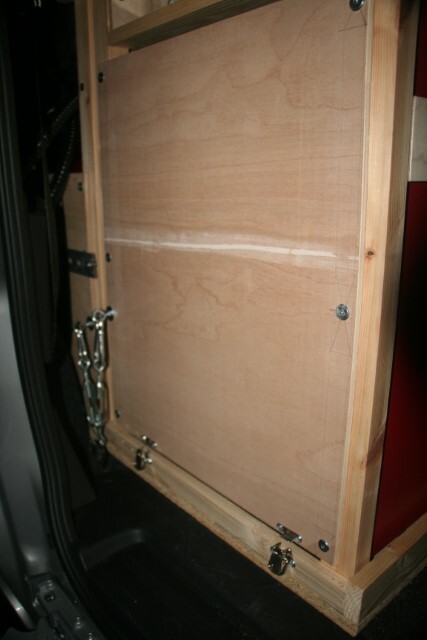 I still had to cut a notch into them to allow for the nuts attaching the whole arrangement to the van body. I bolted the flat plate and bracket together using nylon locking nuts, to prevent it from moving too much while driving and over time. I then attached these to a perforated steel bar I had fixed to the back of the cupboard using bolts and wingnuts for easy removal if and when needed. A bit difficult to see in the picture but there wasn’t a lot of room for manoeuvre. the top bolts just go through the back of the cupboard. So for the bottom ones especially I had to line up 3 holes (one for the bracket, one for the perforated metal bar and one for the back of the cupboard), which seems like a simple job but really wasn’t. I got it together in the end, though. Already, this really provided a firm installation and there was very little movement, but I decided belt and braces would be the best approach. 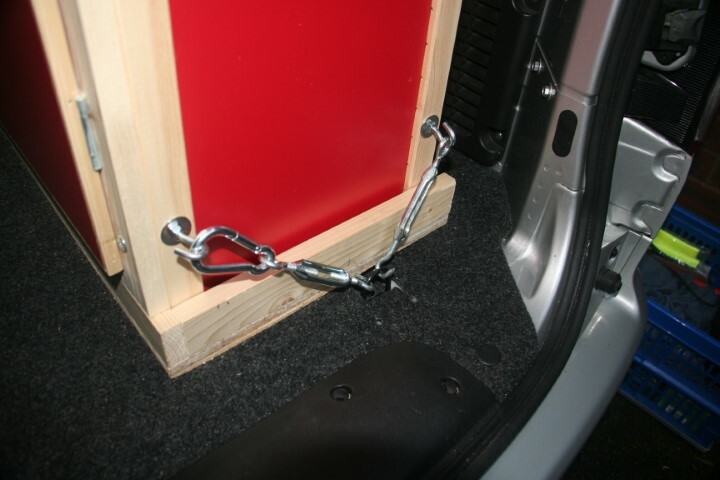 To prevent movement and strain on the brackets I also used turnbukles, and where needed snaphooks, to attach the cupboards to the lashing points of the van. 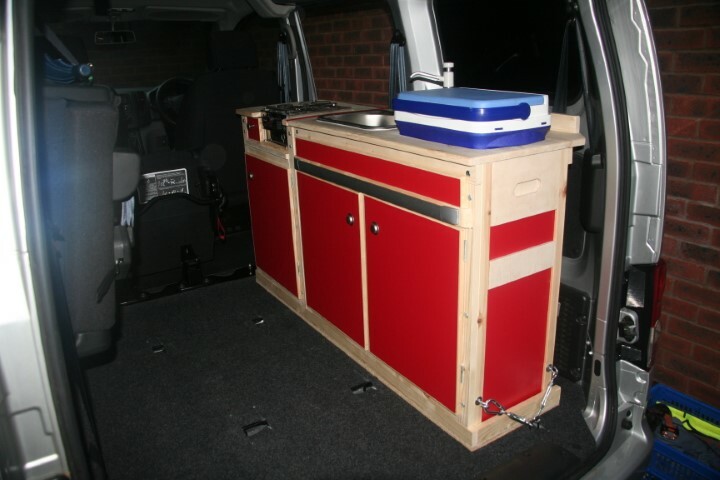 I did the same on the other side, both with the coolbox/sink unit and with the cooker unit. 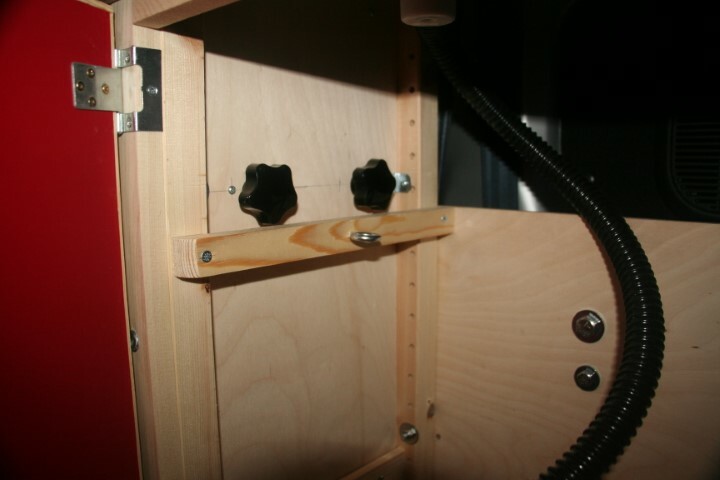 I tried to use cabinet clasps but they were too small and I’m going to remove them, invisibly filling the holes. You’ll notice that at the bottom in both pictures, there’s a piece of sheet material (OSB board I had lying around in this case) with batten attached to it so the cupboards wouldn’t be able to move sideways or forward. I attached this base board by way of a hook bolt and wingnut to the bracket the single second row seat in the combi hooks into (removed to make room for the furniture), providing a solid basis. That was that sorted. I also linked the two cupboards together internally but needed a way to do this so they could easily be taken apart. I found some excellent M10 star knobs at Axminster tools, drilled two holes and done! This is why I attached the two pieces of ply to the sides of the cupboards in case you were wondering. I (at long last!) finished just in time to make a test drive to Weymouth before dark and apart from the cooker slightly rattling, which is unavoidable, everything so far as as sound as a house. I had the good sense to stick small pieces of foam weatherstrip to the inside of the door catches to stop the door latches from rattling. I’m a happy person!